Scalloped Potatoes with a crispy, cheesy top is the best side dish to any meal! 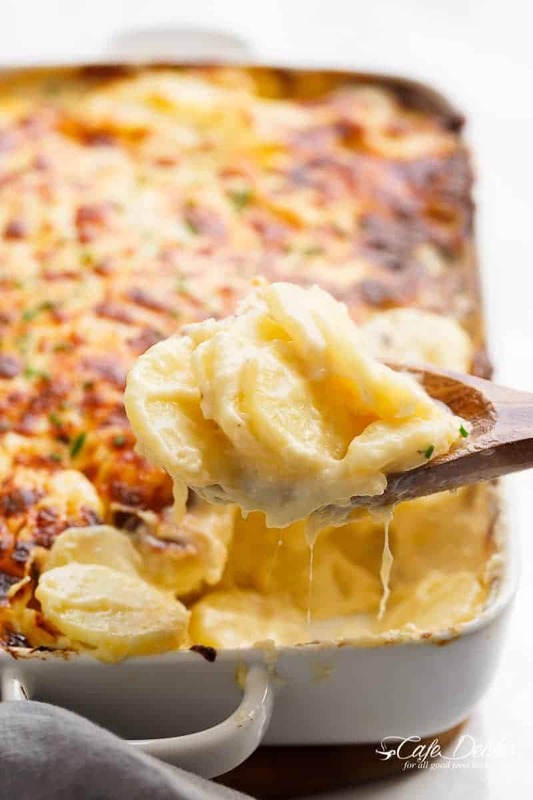 Deliciously cheesy scalloped potatoes are full of garlic flavour and parmesan cheese! 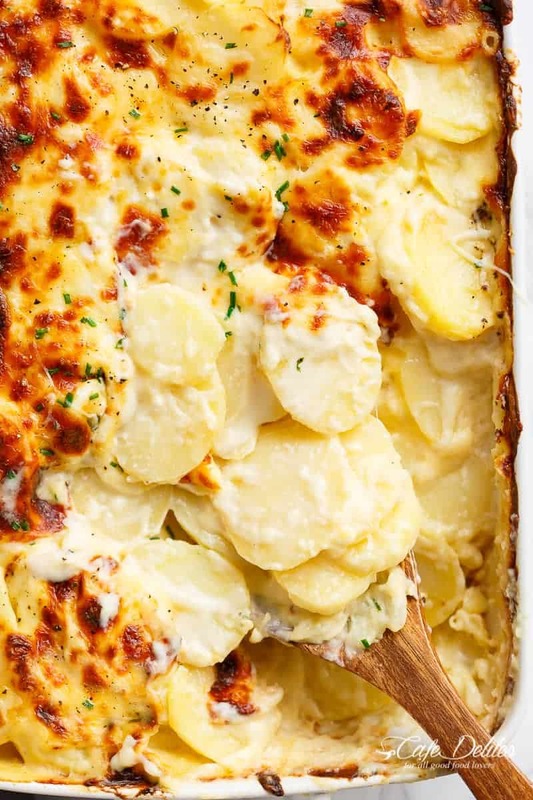 Soft and tender potatoes smothered and enveloped in a thick and creamy garlic sauce, layered with mozzarella cheese for a cheesy string then crisped with your oven broiler or grill to get a crispy, cheesy top layer. 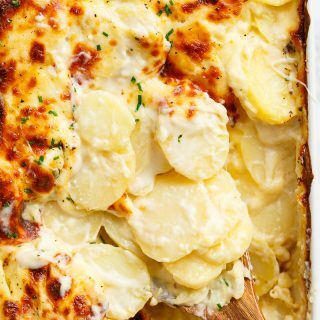 There are scalloped potatoes…and then there are SCALLOPED POTATOES. The kind that are so addictive, you can eat maybe half the pan in one sitting, because in that moment, meat becomes overrated. With the insane chaos this Garlic Parmesan Mac And Cheese is causing, I thought, for one moment, what would potatoes replacing pasta be like. 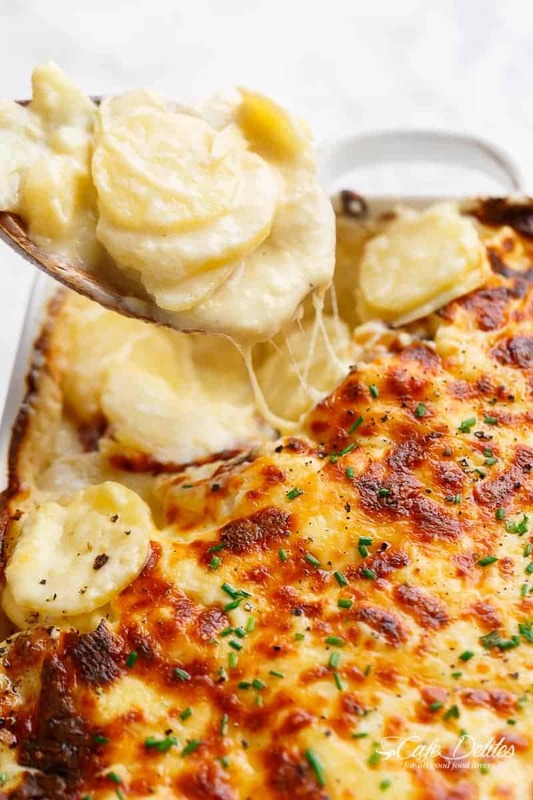 Well…let me just say….these potatoes are the best scalloped potatoes we’ve ever made. The whole family forgot about the juicy roast chicken sitting on the table to make way for this on their plates. Peel and slice potatoes to between 1/8- and 1/4-inch-thick for the best results and even cooking. Use a mandolin for even slicing if you have one! Once you have your potatoes ready, start on your sauce. If you’re not comfortable making a white sauce, you can use about 4 cups of heavy or thickened cream to replace it. Layer potatoes, sauce and cheese in baking dish. Cover tightly with aluminium foil and bake — we cover the dish to allow steam to cook the potatoes through. For a golden top, broil (or grill) on medium heat for 2-3 minutes until cheese is bubbling and golden. Russet potatoes — have the most starch and make the creamiest sauce. Yukon Golds — hold their shape a little better through baking. WATCH US MAKE Scalloped Potatoes (VIDEO) RIGHT HERE! Garlic Parmesan Scalloped Potatoes layered in a creamy garlic sauce with parmesan and mozzarella is the best side dish to any meal! Preheat oven to 400°F | 200°C. Lightly grease a 9 x 13-inch baking pan with cooking oil spray; set aside. Melt butter in a medium-sized pan / pot. Add the garlic and sauté until just fragrant (about 1 minute). Whisk in the flour; continue to cook while whisking (or stirring) for at least 2 minutes. Reduce heat down to low; gradually whisk in 4 cups of the milk (about ¼ cup at a time), whisking between each addition to combine. Bring to a boil until beginning to thicken. Stir in the bullion powder, salt (if needed), and pepper. Set aside. Arrange a layer of potatoes over base of prepared dish. Pour half of the cream sauce over the potatoes, then top evenly with half of the mozzarella cheese, and half of the Parmesan cheese. Arrange the remaining potato slices over the cheese, the remaining creamy sauce, and the remaining cheeses. Cover tightly with aluminium foil and bake for 40 minutes until potatoes are just tender. Remove foil; cook for a further 30 minutes or until top is golden and the sauce is bubbling. For a crispier top, broil (or grill) on medium heat for 2-3 minutes until cheese is crispy. Has anyone tried using almond milk instead? Can you cook this at a lower temperature? If not can you make ahead and reheat at a lower temperature? It looks delicious. Thank you. I’m just curious if I should use salted butter or unsalted butter. These were awesome. I made them for dinner tonight. The recipe is a keeper. Took me longer than 15 minutes, but were worth the trouble. Have you tried this recipe in a crockpot? Wanted to take to a retirement party. Omg wherrrree did this recipe go???!!! Does anyone have it? I did not write it down (big mistake) and trusted my Pinterest to save it. If anyone has it, I’d be very grateful! One word- DELICIOUS!!!!!!!!!! I tried this last night with dinner and it was a hit, my husband LOVED it! I felt like a genius all day! Thanks, Karina! Made them for Christmas Eve. I did onions and 1t of minced garlic. I also used Yukon Gold potatoes and a bit less cheese. They were so good, my mom asked me to share the recipe with her; which may be a first! I will be making this as well as the chicken, they both look delicious thanks for the recipes. I Love scalloped potatoes, but hate how long they take to cook. I Diced the potatoes and boiled them in salt water until almost done. This cut the cooking time to about 20 minutes! Also added diced onions to the butter garlic sauté and it was great. Im in a dilemma! Im cooking this for thanksgiving but I’m making 12 servers which is double the original amount for the recipe. How much more time should I add on for the potatoes to be thoroughly cooked? O.M.G this came out GREAT!! Love, love LOVE it!!! I’m wondering if we can prepared this ahead of time? Maybe the night before? Do you think you can make this in a crock pot? I am also wondering if these could be prepped ahead of time, either the night before or the morning of? These are delicious! I halved the recipe ( just me and my husband). And we still ate for two days. Very good reheated. Going to make go Easter. Thank you for great recipe! Can you put this together ahead of time (the day before) and bake when needed? Have you tried freezing these and baking later? I’m meal prepping for maternity leave! I served these to go along with my husband’s wonderful grilled steaks. It turned out very delicious. It takes some time to put together so this is not a quick dish. I also had to bake it a lot longer than the recipe said, and I’m not sure why, but next time I will start this a lot earlier than I did. It is delicious and great for special occasions or company. Now I’ve got to try the Mac & Cheese version! Yes! The Mac and Cheese version is crazy good! I’m glad you liked it Christine! I’m from the uk a dim not sure what is chicken bullion? After living in Australia for many years, and they are very similar to the UK, its the same as chicken stock powder. Just made these tonight. This will be one of my go to recipes. A big hit with the whole family. Thanks for a great recipe. I use a combination of yams and red potatoes. Just wondering what type of potatoes you used with the great results? I was thinking Yukon gold. But, want to use the kind you’re review was based on for Christmas dinner. Thank you! Mary Beth, Yukon Gold are perfect for these potatoes! Definitely use those! This looks so great. I will definitely try. You sure don’t disappoint! I have tried about 3-4 of your recipes and all have been awesome and will definitely use again!thanks for posting! This sounds and looks delicious, thanks for sharing. Oh my cheese! This looks so goooooood. I have bookmarked it to make for my family christmas get together. I want this in and around my face right now!